If you have a one-time task that needs to be completed for a specific property, you can create a manual task following the instructions below. (Note: If you have followed a link to this page from either the Offers or Preservations section, you will want to start at step #3). 2. 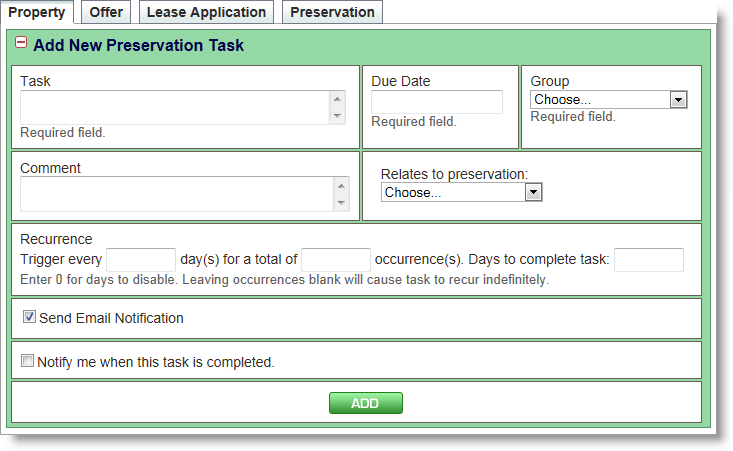 Click the sub tab at right that describes the type of task you are creating: Property, Offer, or Preservation. 4. In the Task field, enter a task name. 5. Click the Due Date field. A calendar will open up. Click the date on which the task should be completed. 6. In the Group field, select the group that will own the task. When you do so, an Assigned to field will appear, which you can use to assign the task to a specific individual. 7. Add any desired comments in the Comments field. 8. If you are adding an Offer or Preservation task, indicate which offer or preservation the task is regarding using the drop-down arrow in the Relates to field. Use the Trigger every ___ days field to indicate how often the task should occur (for example, every 5 days). Note how many times you want the task to recur in the total of ___ occurrence(s) field. If you want the task to recur indefinitely, leave this field blank. DO NOT place a zero in this field or the task will not kick off at all. Use the Days to complete task field to indicate each recurring task's duration. For more information on how recurring tasks work, see Recurring Tasks. To disable a recurring task, place a zero in the "Trigger every __ days" field. 10. If you wish to notify the assigned individual that you have created the task, click the Send Email Notification check box. Broker Brain will send an email notification to the assigned individual and will save it as a note on the task. 11. To receive an email notification when this task is completed, enable the Notify me when this task is completed check box. 12. Click Add to create the task. Once you have added a task, it will display in the Incomplete Tasks section of the screen. You can locate the task and click the + next to the task name to expand it. This will show you all the task details. Note: For a full description of the fields in the task bar, see Task Layout Detail.